Judy, you say you have no apparent leaks, but be sure to check carefully for any evidence of moisture inside cabinets, storage compartments, under the coach, etc. If you are absolutely sure no water accumulation exists it might be time to have the water pump itself checked. Some pumps can leak internally, meaning that even though there is no call for water (no faucet turned on), it may have an integral leak. The pressure switch, built into the pump head, senses a drop in pressure and short cycles the pump. It’s like the pump “burps” for a few seconds. Basically it starts up, quickly builds the pressure and then shuts down. A weak spring in the pressure switch could be at fault. Or possibly a worn seal is not fully shutting off the water flow through the pump head. With an internal leak, there would be no evidence of water accumulating or dripping. 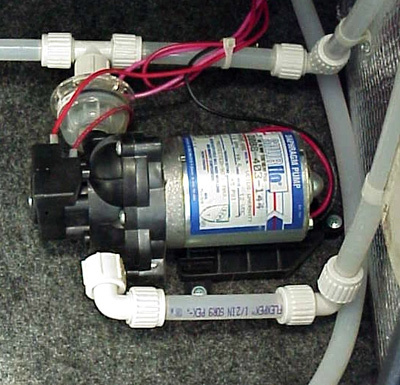 But carefully check all the fresh water plumbing tubing in the RV, including the hot side just to be sure. A cracked fitting anywhere in the system, even though it may not be enough to gather a huge puddle, can still cause a drop in system pressure; enough that the pressure switch senses this reduction and starts the cycling. One sure-fire way to test the pump is to cap off the outlet fitting right at the pump. You may have to purchase a plug or a cap in order to do this, but by terminating the outlet port of the pump, you’ll be able to isolate the problem to the pump itself, or another fitting or component somewhere in the rest of the system. After you cap off the outlet port, turn the pump back on and wait. If it still short cycles periodically over the course of a couple hours, there is a problem inside the pump. If the short cycling stops completely, there is a seeping fitting somewhere else in the remainder of the system meaning further troubleshooting would then be in order. As far as the pump being noisy, be sure it is secured well to its mounting surface. The best location is flat on the floor of the coach. Make sure the mounting screws and rubber isolators are intact and secure. If the fresh water tubing is semi-rigid PEX, it’s advantageous to have a double loop of flexible tubing connect directly to the outlet side of the pump before it attaches to the rest of the PEX tubing, (unlike the photo above). SHURflo makes a “Silencing Kit” consisting of a couple flexible connectors and the appropriate fittings. This kit is adaptable to any RV water pump. Ask for Part Number 94-591-01. If the pump is still overly noisy, another option is to add an in-line accumulator. The accumulator invokes a cushion of air and acts like a shock absorber of sorts to soften the vibrations caused by pumping water.